Every motorhome comes with certain limits as to the weights which it can carry and how the weight should be distributed throughout the vehicle. Sticking to these limits is extremely important as overloading can have a detrimental effect on handling, performance, stopping distances, and overall safety and stability which could lead to an unecessary motorhome insurance claim. This guide explains the jargon surrounding motorhome weight limits, and gives advice on how to calculate the weights which your motorhome can handle when adding things such as a rear scooter rack. First of all, let’s tackle the different weight limits which need to be considered and what each of them mean. The MIRO is the weight of your motorhome as it left the factory, a full tank of fuel and an average driver weight of 75kg, but before any other contents are added. 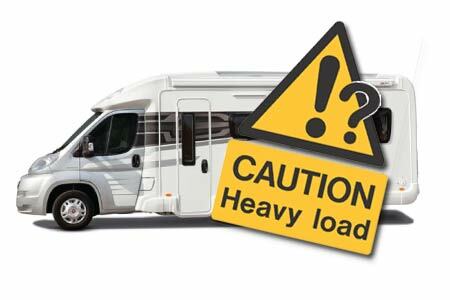 The MTPLM is the maximum amount which your fully laden motorhome can weigh and still be legal to drive. (The MTPLM is the MIRO plus the Payload). The payload is the weight of passengers, equipment and belongings (gas bottles, clothing, food stuffs, solar panels, leisure batteries, bike racks etc) which you carry around with your motorhome. Your maximum payload is usually given by your motorhome manufacturer. With your motorhome fully loaded ready for your trip you can easily calculate your MTPLM by going to a weigh bridge (there is normally a small charge). If you’re over the MTPLM figure, you obviously need to reduce your payload by removing items from the motorhome. Many motorhome owners like to add a rear bike rack for pedal cycles, small motorbikes or scooters. 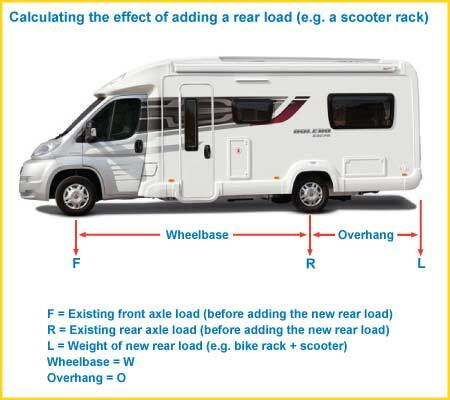 But it’s important that if you are adding a rack then you carefully calculate the effect this will have on your motorhome’s front and rear axle loading, as these both have their own specific limits (which can be found on your motorhome’s weight plate usually found under the bonnet or inside the cab door). The diagram below shows an Alko chassis weight plate for an Auto-Trail motorhome. When adding weight behind the rear axle the back tyre becomes a pivot point meaning any added weight will increase the load on the rear axle but actually decrease it on the front one. The diagram below shows the different measurements you need to be able to accurately calculate the effect of adding a new rear load. 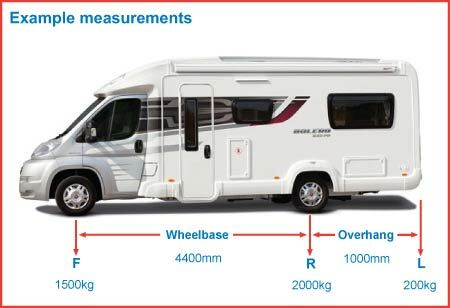 Your motorhome’s size measurements should be in your handbook, and your front and rear axle load can of course be calculated at a weigh bridge by simply placing only the front or rear tyres on the sensor area (some weigh bridges may have equipment which can calculate front and rear axle loading independently automatically). The diagram below gives some example measurements. In the above example we are adding a new load (L) of 200kg to the rear overhang of the motorhome. To work out the effect this will have on the motorhome’s front and rear axle loads we can use the formula, and simply replace the letters with the values in the example diagram above. 1500 – [200 x (1000 ÷ 4400)] which equals 1454.54kg. So we now know that new front axle load once the new overhang weight is added works out at 1454.54kg and can then use this figure to work out the new rear axle load (which we’ll call “new R”). 2000 + 200 + (F – new F) which equals 2245.46kg. In other words, for this motorhome adding a new overhang weight of 200kg (perhaps a motorbike rack) would add 245.46kg of load to the rear axle, whilst taking 45.46kg off the front axle load. 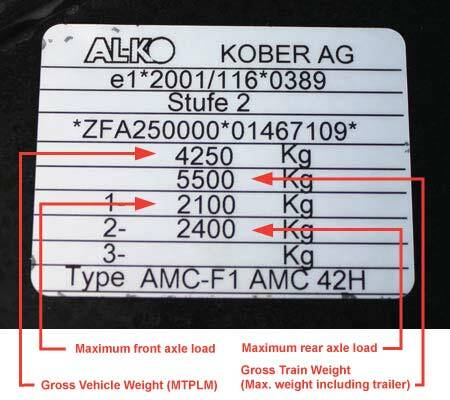 So if the maximum permissible rear axle load was 2400kg and the MTPLM was 4250kg, as per the chassis plate in the photo further up, then adding 200kg to the rear overhang would still be well within the permissible limits. You need to be very careful not to overload the rear axle and overly reduce the front axle load. It’s not only unlawful but will cause your motorhome to tip at the rear causing potentially dangerous handling, steering and traction issues. We’d always advise calculating the load on your front and rear axles when your motorhome is fully loaded to make sure you’re within safe limits. Why can’t motorhome manufacturers quote the weight on each axle when the van is unladen. With a lot of coach built vans that have a long overhang the load on the rear axle is fairly high. Add a tow bar and a couple of electric bikes ther is’nt a lot left. I have asked several several suppliers but they only quote the max laden weight and the max weight allowed on each axle. Hi Craig, great article. I’ve weighed my van on the local weigh bridge and am within the limits for MTPLM which is 3400kg. can I increase this to 3500 kg and how do I go about it? Thanks for your help. All motorhomes have a weight plate which gives the MPTLM. If that’s not giving you enough payload it is sometimes possible to simply have the motorhome ‘replated’ as long as it’s officially documented. Sometimes increasing payload involves more major physical modifications to your vehicle. We did find this website useful http://www.svtech.co.uk/vehicles/motorhomes/, although we’re sure there are many other companies that offer these services around the country. Try searching for ‘replating a motorhome’ in Google. I have just come across this article and believe it is incorrect or at least out of date. On reaching 70 years of age driving licences have to be renewed and automatically reduce the entitlement to a maximum of 3500kg regardless of your entitlement prior to your 70th birthday. The entitlement can be increased by taking a medical test and effectively holding an HGV licence. If at 70+ only the 3500kg entitlement is held then it is not legal to tow a trailer with a 3500kg motorhome as mounting a trailer (regardless of its weight) will invoke the Train Weight of the vehicle which will be in excess of 3500kg. Thanks for the comment Mike. I have added a comment to validate what you have said. Thanks Alan. Glad you found it helpful. My dad is over 70 and wants to buy a motor caravan with a MAM of 3500, he wants to tow a trailer and motorbike , the bike weighs at least 200Kg. Is this over the limit please? Sorry for the delay. We’re looking into this for you. We’ve heard back from our towing expert, Stephen from Silver Fox Driver Training and can confirm that provided that the proposed trailer’s MAM is within the towing capacity of the vehicle (check the motor caravan’s VIN plate, handbook or registration documents), the only other restriction will be in regards to your Dad’s licence. Presuming that he passed his test prior to 1997 and therefore has a B+E qualification, then he is licenced to tow a trailer with a MAM of 3500kgs. On a Cat B licence the max trailer size will be 750kgs for the motor caravan in this instance. Age, incidently, has no bearing on the legalities. Mike Gadd is correct that the advice has changed here. Please note the line in Lucie’s response: ‘Age, incidentally has no bearing on the legalities’ is now incorrect. Once a driver reaches 70 their existing licence is replaced with one that has a limit of 3500kg. If you want to drive drive motorhomes towing a trailer with a MAM of over 3500kg (up to 8250kg) again, you will need to apply for the licence to do this and submit a medical examination report. Please see this link DVLA towing guidance. can I drive a 3850 mtplm weighted motorhome providing I keep the weight down to 3500mtplm as I am over 70 ? Great tips and helpful advice! So now it gives me an idea on how to calculate the safety limits of a motorhome. Thanks. 1) Finding a weighbridge is not easy in my area,the only ones seem to be at scrapyards or similar where the access roads are littered with scrap and debris that can ruin tyres.Does anyone have a list of weighbridges for UK or in particular the Wirral area. 2) This features focuses on not overloading the rear axle and tyres.However it gives no guidance on when the loading on the front tyres could be reduced to create a dangerous situation (loss of grip of front tyres).This does concern me since my Hymer Van based on a front wheel drive Transit chassis is very light on the front even when empty and easily wheel spins in the wet when pulling away (especially on gradients) even when controlling the clutch very carefully.I wonder if other owners of Hymer Vans have similar problems and if not what tyres they are using (mine are Continental Vanco as fitted when new).